The genus name Vaccinium is a classical Latin name for a plant, possibly the bilberry or hyacinth, and may be derived from the Latin bacca, berry. The specific name is derived from Latin vitis ("vine") and idaea, the feminine form of idaeus (literally "from Mount Ida", used in reference to raspberries Rubus idaeus). Vaccinium vitis-idaea spreads by underground stems to form dense clonal colonies. Slender and brittle roots grow from the underground stems. The stems are rounded in cross-section and grow from 10 to 40 cm (4 to 16 in) in height. Leaves grow alternately and are oval, 5–30 mm (0.2–1.2 in) long, with a slightly wavy margin, and sometimes with a notched tip. Vaccinium vitis-idaea keeps its leaves all winter even in the coldest years, unusual for a broad-leaved plant, though in its natural habitat it is usually protected from severe cold by snow cover. It is extremely hardy, tolerating temperatures as low as −40 °C (−40 °F) or lower, but grows poorly where summers are hot. It prefers some shade (as from a forest canopy) and constantly moist, acidic soil. Nutrient-poor soils are tolerated but not alkaline soils. V. vitis-idaea var. vitis-idaea L. — syn. V. vitis-idaea subsp. vitis-idaea. V. vitis-idaea var. minus Lodd. — syn. V. vitis-idaea subsp. minus (Lodd.) Hultén. Lingonberry has been commercially cultivated in the Netherlands and other countries since the 1960s. Empress Elizabeth ordered lingonberry to be planted all over Peterhof in 1745. In cultivation in the United Kingdom, the Koralle Group has gained the Royal Horticultural Society's Award of Garden Merit. The berries collected in the wild are a popular fruit in northern, central and eastern Europe, notably in Nordic countries, the Baltic states, central and northern Europe. In some areas, they can legally be picked on both public and private lands in accordance with the freedom to roam. 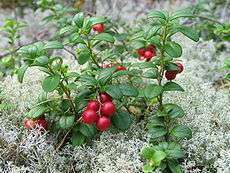 The berries are quite tart, so they are often cooked and sweetened before eating in the form of lingonberry jam, compote, juice, smoothie or syrup. The raw fruits are also frequently simply mashed with sugar, which preserves most of their nutrients and taste. This mix can be stored at room temperature in closed but not necessarily sealed containers, but in this condition, they are best preserved frozen. Fruit served this way or as compote often accompany game and liver dishes. In Sweden and Norway, reindeer and elk steak is traditionally served with gravy and lingonberry sauce. Preserved fruit is commonly eaten with meatballs, potato pancakes. A traditional Swedish dessert is lingonpäron (literally lingonberry pears), consisting of fresh pears which are peeled and boiled in lingondricka (lingonberry squash) and then preserved in the pear-infused lingonberry squash and commonly eaten during Christmas. This was very common in old times, because it was an easy and tasty way to preserve pears. In Sweden and Russia, when sugar was still a luxury item, the berries were usually preserved simply by putting them whole into bottles of water. This was known as vattlingon (watered lingonberries); the procedure preserved them until next season. This was also a home remedy against scurvy. This traditional Russian soft drink, known as "lingonberry water", is mentioned by Alexander Pushkin in Eugene Onegin. 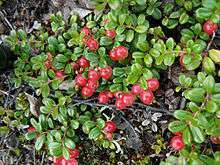 In Russian folk medicine, lingonberry water was used as a mild laxative. A traditional Finnish dish is sautéed reindeer (poronkäristys) with mashed potatoes and lingonberries, either cooked or raw with sugar. In Finland, a porridge made from the fruit is also popular. In Poland, the berries are often mixed with pears to create a sauce served with poultry or game. The berries can also be used to replace redcurrants when creating Cumberland sauce to give it a more sophisticated taste. The berries are also popular as a wild picked fruit in Eastern Canada, for example in Newfoundland and Labrador and Cape Breton, where they are locally known as partridgeberries or redberries, and on the mainland of Nova Scotia, where they are known as foxberries. In this region they are incorporated into jams, syrups, and baked goods, such as pies, scones, and muffins. 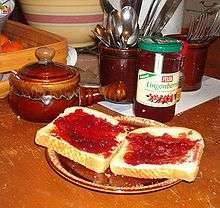 In Sweden lingonberries are often sold as jam and juice, and as a key ingredient in dishes. They are used to make Lillehammer berry liqueur; and, in East European countries, lingonberry vodka is sold. The berries are an important food for bears and foxes, and many fruit-eating birds. Caterpillars of the case-bearer moths Coleophora glitzella, Coleophora idaeella and Coleophora vitisella are obligate feeders on V. vitis-idaea leaves. The berries contain plentiful organic acids, vitamin C, vitamin A (as beta carotene), B vitamins (B1, B2, B3), and the elements potassium, calcium, magnesium, and phosphorus. In folk medicine, V. vitis-idaea has been used as an apéritif, astringent, antihemorrhagic, anti-debilitive, depurative, antiseptic (especially for the urethra), a diuretic, a tonic for the nervous system, and in various ways to treat breast cancer, diabetes mellitus, rheumatism, and various urogenital conditions. In traditional Austrian medicine the fruits have been administrated internally as jelly or syrup for treatment of disorders of the gastrointestinal tract, kidneys and urinary tract, and fever. Vaccinium vitis-idaea differs from the similar cranberries in having white flowers with petals partially enclosing the stamens and stigma, rather than pink flowers with petals reflexed backwards, and rounder, less pear-shaped berries. Hybrids between Vaccinium vitis-idaea and Vaccinium myrtillus, named Vaccinium × intermedium Ruthe, are occasionally found in Europe. ↑ Åkerström, Lola Akinmade. "10 things to know about Sweden's food culture". 10 July 2012. Sweden.se. Archived from the original on 2012-07-15. Retrieved 26 August 2013. 1 2 Elden J. Stang; Gavin G. Weis & John Klueh (1990). 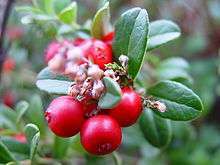 "Lingonberry: Potential New Fruit for the Northern United States". In J. Janick & J.E. Simon. Advances in new crops. Timber Press. pp. 321–323. ↑ "Vaccinium vitis-idaea". Natural Resources Conservation Service PLANTS Database. USDA. ↑ Hyam, R. & Pankhurst, R.J. (1995). Plants and their names : a concise dictionary. Oxford: Oxford University Press. ISBN 978-0-19-866189-4. p. 515. ↑ Coombes, Allen J. (1994). Dictionary of Plant Names. London: Hamlyn Books. ISBN 978-0-600-58187-1. p. 187. ↑ Hall, Joan Houston (2002). Dictionary of American Regional English. Harvard University Press. p. 47. ISBN 0-674-00884-7. Retrieved 2007-11-16. ↑ "Санкт-Петербургские Ведомости - Рынок - Моченый шедевр". spbvedomosti.ru. 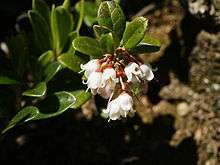 ↑ "RHS Plant Selector Vaccinium vitis-idaea Koralle Group AGM / RHS Gardening". Apps.rhs.org.uk. Retrieved 2013-06-04. ↑ "Picking flowers, berries, mushrooms, etc.". The Swedish Environmental Protection Agency. Naturvårdsverket. Retrieved 13 March 2016. 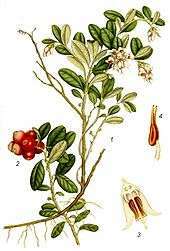 ↑ "Lingonberry, raw - Nutrition Information and Facts". Department of Nutrition, National Food Institute - Technical University of Denmark. 2009-01-13. Retrieved 2015-09-17. ↑ James A. Duke. "Vaccinium vitis-idaea (ERICACEAE)". Dr. Duke's Phytochemical and Ethnobotanical Databases. Retrieved May 22, 2011. ↑ Vogl, S; Picker, P; Mihaly-Bison, J; Fakhrudin, N; Atanasov, AG; Heiss, EH; Wawrosch, C; Reznicek, G; Dirsch, VM; Saukel, J; Kopp, B (2013). "Ethnopharmacological in vitro studieson Austria's folk medicine - An unexplored lore in vitro anti-inflammatory activities of 71 Austrian traditional herbal drugs". J Ethnopharmacol. 149: 750–71. doi:10.1016/j.jep.2013.06.007. PMC 3791396 . PMID 23770053.